An updated abstract, (copies turned in to teachers in Dec, 2018 were sent to judges). All signed Human Subjects Consent Forms were to be submitted in December, 2018. Due Sun, Jan 27: in Seton School’s gym (John Paul II Center) between 2:00pm – 5:00pm. Use Titles for each section of the board: Print “Problem”, Hypothesis”, etc. or use pre-printed labels to delineate the sections on your board. Do not make these labels by hand. Your own artwork is welcome everywhere else on the board. A copy of your abstract: Note: If you have changed your abstract since the original version was submitted, you must bring in 6 copies. All students are to attend 8:30 AM Mass at All Saints Church on Monday. After Mass, report to gym (JP II Center) for attendance and announcements, pick up your nametag, and go to your project. Students will remain at their projects all day. Bring a bag lunch– You will not be allowed to leave to buy lunch. DO NOT Bring any electronic devices such as computers, computer games, ipods, ipads, mp3 players, etc. Seton’s cell phones policy remains in effect for the duration of the school day. If parents need to reach their students, please call the school office. 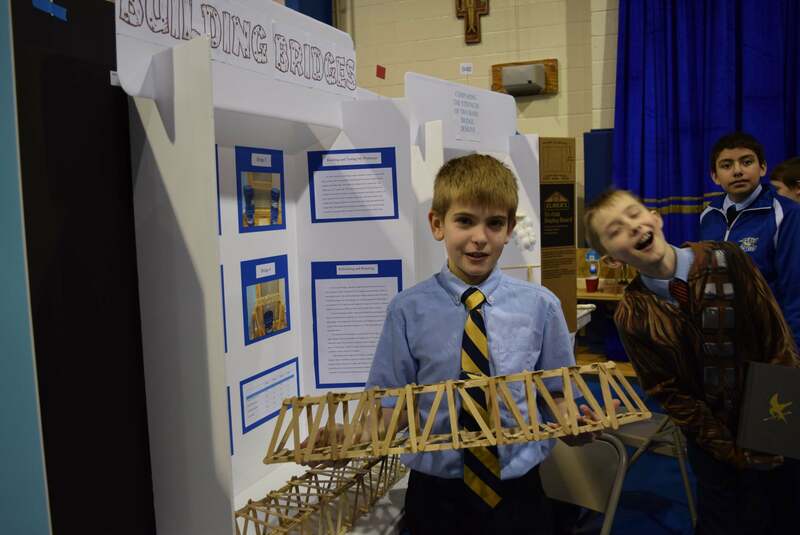 Only science fair judges and teachers will be allowed free access to JPII. All others will require prior arrangement to see the projects during the hours of the fair. Students must stay by your project – You will be able to view the other students’ projects before judging begins (10:00 AM) and during the lunch break (12:00 PM). For anyone wishing to see the projects on Monday night, we would recommend that you come a bit early to the PRO meeting. Volunteers are needed to help move tables back to their rooms’ after the PRO Meeting. We need to prepare the JPII Center and classrooms for school on Tuesday. 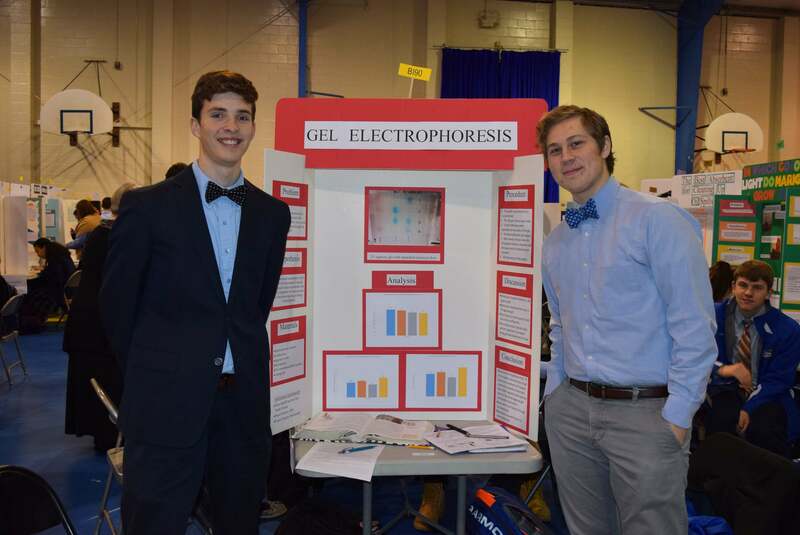 The Science Fair (as much as possible) will need to be held on the scheduled date due to the large number of volunteers who have arranged to take time off from their jobs. Therefore, every effort will be made to hold the Science Fair on Monday Jan 29, 2018 regardless of the weather. All students, teachers, and judges who are able to safely travel to Seton School should. Jupiter Ed will be utilized in the event that PWC schools are cancelled due to weather. We will not have a delay regardless of what the county does. The first judging session will begin promptly at 10:00am and all students should be at their project by 9:45am. We thank you for your cooperation and help. 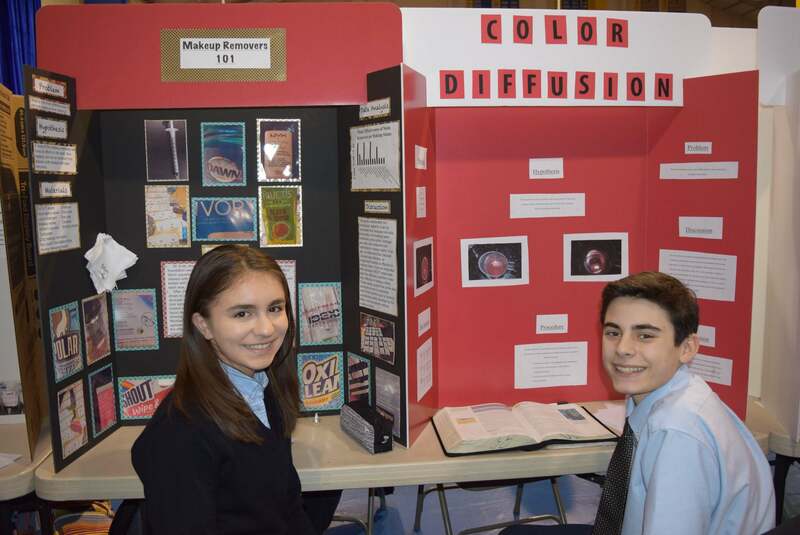 Seton School participates in a Science Fair every year. Both junior and senior high students participate. All 7th grade students and High School students that are taking Biology participate in the Science Fair. 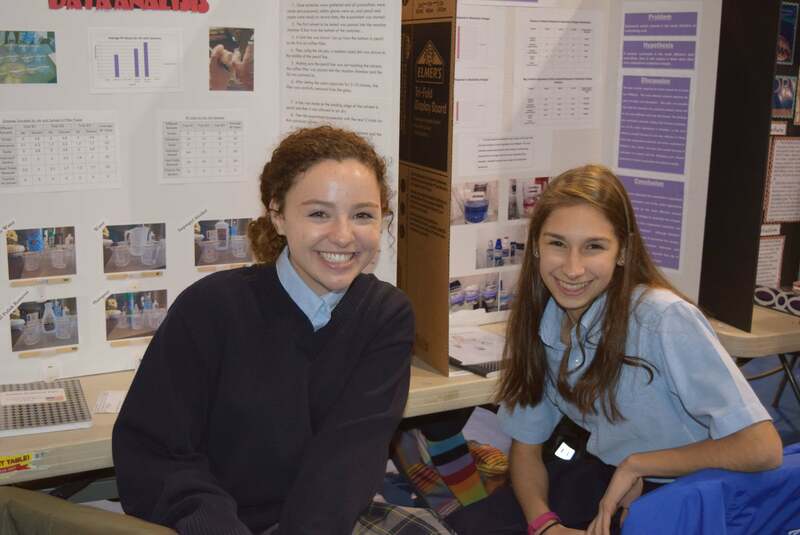 Those students that transfer into Seton and have already taken Biology still are required to participate in the Science Fair in order to graduate. Both the Earth Science and Biology classes focus a lot of time preparing for the Science Fair. 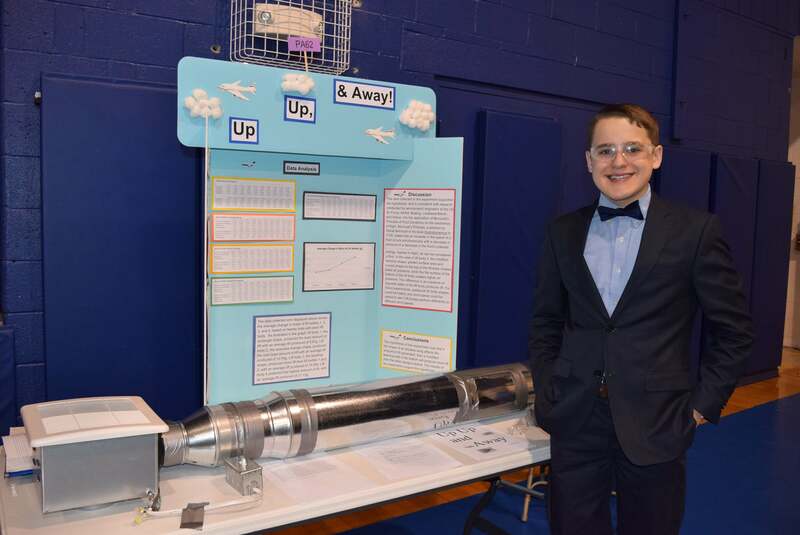 Seton School has traditionally chosen to run its science fair in keeping with both the Prince William County Regional Science Fair and the INTEL International Science and Engineering Fair. Therefore, all projects and paperwork, as well as deadlines are completed with this in mind. 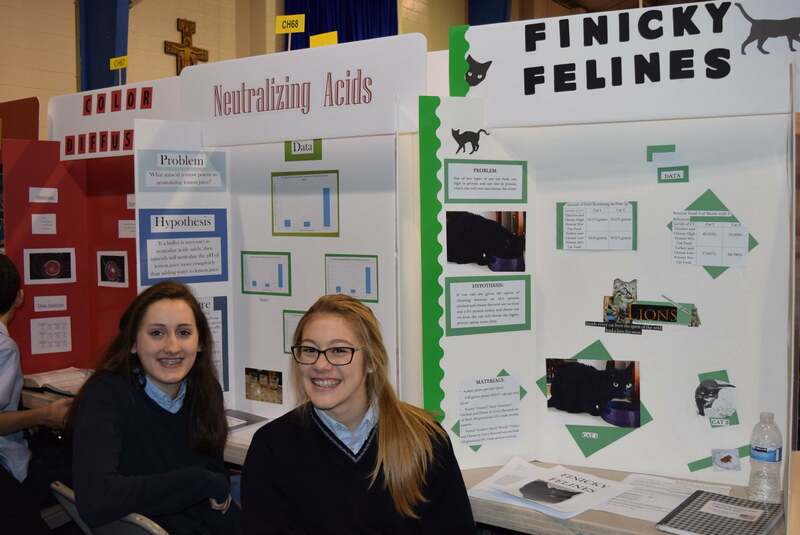 The Seton Science Fair is usually held in early February to assure plenty of time for students and teachers to complete the needed paperwork for those students who would continue on in these science competitions. 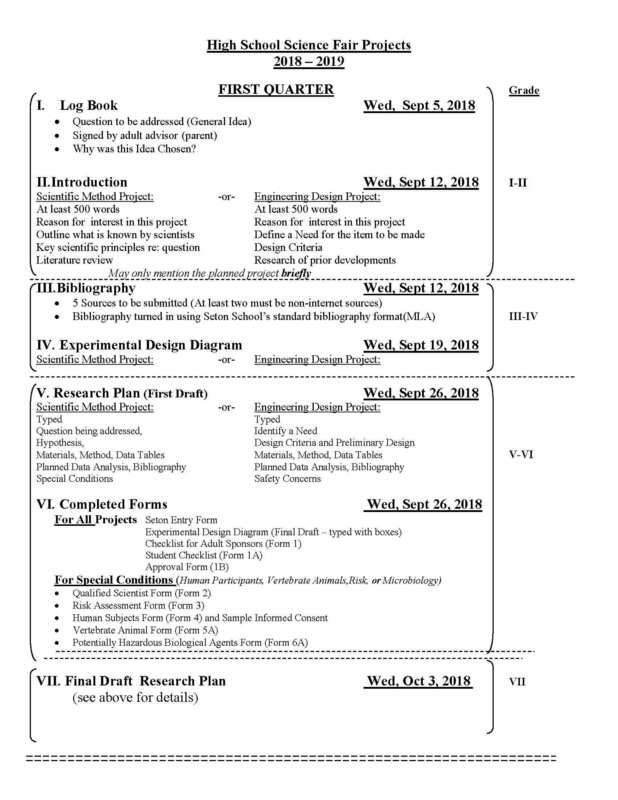 Students should aim to finish their projects by Thanksgiving and before the Christmas holiday. 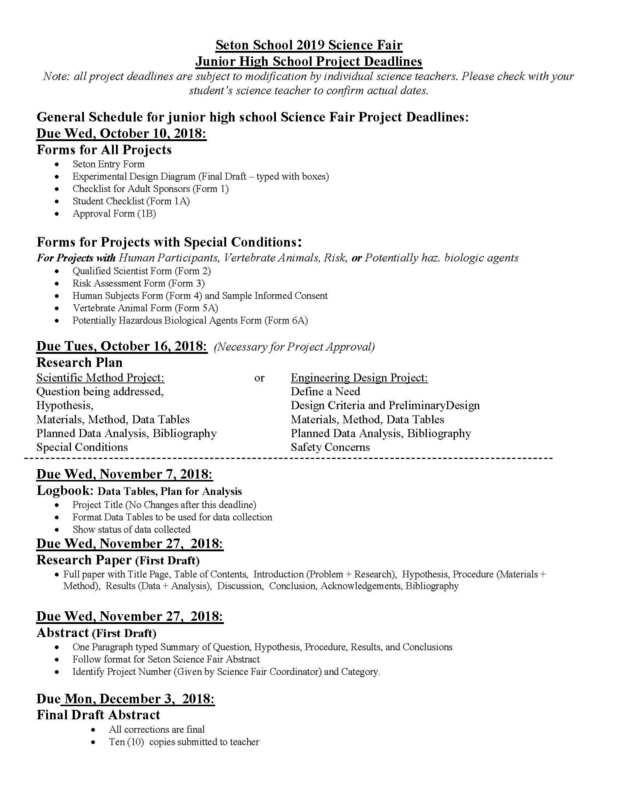 Download our Science Fair Packet below for more info! Select a topic: Get an idea of what you want to study or learn about. Ideas should come from things in your areas of interest. A hobby might lead you to a good topic. What factors influence some aspect of this topic? Can any of these factors be altered? If so, will something change? Is this of interest / importance to you? Listen to current news reports. Is there an issue that is of concern to the general public or to a specific group that interests you? Is there anything changeable that could potentially influence this issue? Is there a method of doing something that interests you? Is there a technique that could be improved upon? Will an improvement in technique affect you or the public at large? Is there a process or piece of equipment that could be modified to show an improvement? Pick a question or problem that is not too broad and that can be answered through scientific investigation. Remember- your experimentation must be completed by the beginning of December! Scientific Method Investigation – experiments with independent variables and control set up. Engineering Design Project- design something for which there is a need, evaluate and modify it. Find out if there are unanswered questions or concerns that you might be able to investigate with your project? Investigate the factors (environmental or manmade) that can possibly influence this topic. Talk to experts: Ask professionals who work in the field of your topic what questions or problems could be investigated experimentally. Ask what issues would, if addressed experimentally, could be solved and be of help to them in their work. Look at your personal resources at home or at school to see what equipment is available for your use for investigating this issue experimentally. Sign up an adult sponsor to work with you throughout your experiment. Get them to commit their help and advice for your project. You will need them to discuss details of your project with you, and help you to solve practical problems along the way. Consider them your cheerleader – do not ask them to do your project for you! Consider enlisting the help of interested adults with expertise with the topic you are considering. These additional adults do not have to be your adult sponsor. Be practical: consider materials and equipment available to you, evaluate the time allowed for the completion of the project Look at your family and school commitments (Project should be completed by the 1st week of December). 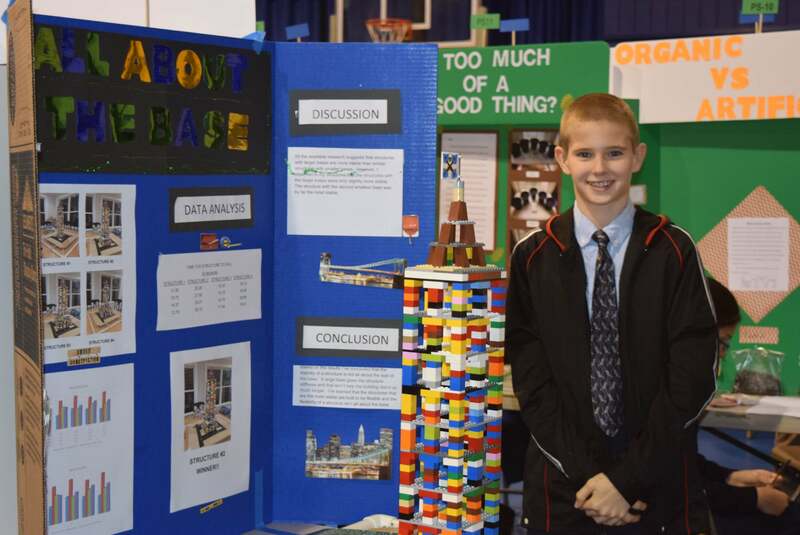 Ask your adult sponsor to help you decide what question can realistically be answered in your science fair project. If the question posed is important but is too broad, consider addressing a small piece of the puzzle for your science fair project. Leave the bigger question for another scientist. List at least 5 good sources, (2 of which are not internet sources). Organize your ideas and what you have learned through your research. Narrow your focus to a particular area of this project. Decide finally what question you would like to ask. Write this question in your Project Data Book (log book). List key factors that might affect the outcome of an experiment designed to answer the question chosen. Be sure to include a clear (but brief) statement of what you intend to do and what you plan to measure. Make sure your question is testable and can be done in the available amount of time. Your hypothesis should include what is being tested and what result you expect. For Scientific Method Projects: State Hypothesis. Identify the Independent Variable, levels of Independent Variable, constants, Control, and Dependent Variable (with units). Make sure to plan enough trials (participants, etc) in each group to allow your results to be statistically significant. NOTE: Engineering Design Projects will still need to use the Scientific Method when testing the success of the prototype. Use this as a guide to prepare a Research Plan for your project. Prepare a Research Plan (Follow the guidelines for the Research Plan) List all materials, and make sure all details of your procedure are explained clearly. Discuss your research Plan with your adult supervisor before submitting it to science teacher for approval. 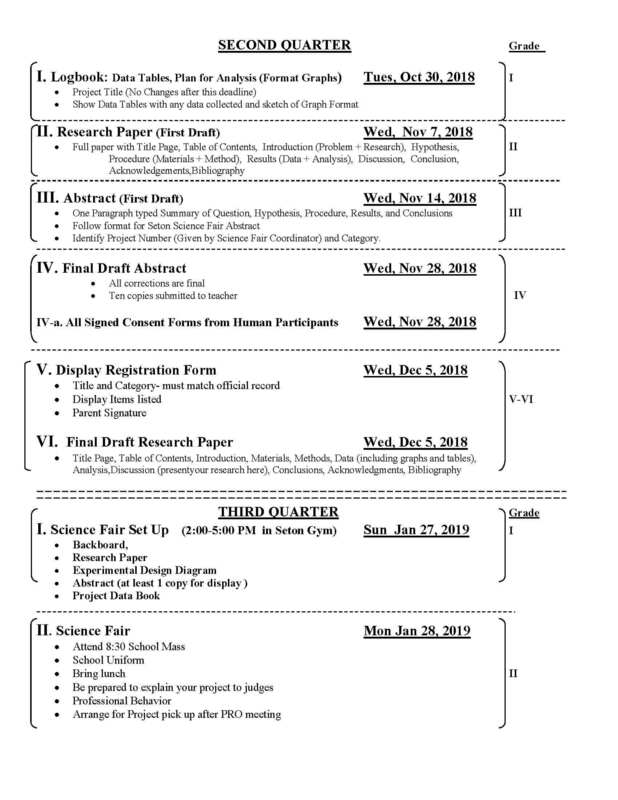 Prepare the Approval Form (Form 1B) for Seton’s Science Department to complete after review of your Research Plan and other Forms. Turn in all these papers to your science teacher. They will be reviewed and you will be notified of either project approval or the need to do further preparation before your project can be approved. NOTE: you can only begin formal experimentation after project is approved. You are encouraged to informally test steps of your procedure to make sure it is the best method even before writing up your research plan*. No results from this informal experimentation can be used in your project. 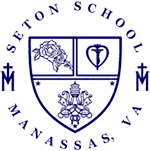 * Any informal testing of procedure before Seton School’s review must be done under the guidance and supervision of your adult supervisor and with permission of your parents. Follow all safety precautions as directed by your adult supervisor/parents. Observation & Question (ask “what would happen if …..”) Informal testing is part of this step. Hypothesis– a possible explanation for an event or set of observations. Must be specific enough to be tested in your experiment. (“If…… then……”) Predict what will happen in your experiment. “Variable” = any changeable factor that can influence the outcome of an experiment. “Independent Variable” = the single variable that is selected to be changed for the experiment. “Constants” = any factor that if allowed to change would influence the outcome of an experiment. These factors are held unchanged for the duration of the experiment. “Safety Measures” = identify any potential risks associated with the experiment, and tell how dangers will be avoided. Results – Gather Data-Prepare data tables before experiment begins. Carefully record observations and measurements using data tables and charts in a project data book (log book). Analyze Data-Examine results using modes for qualitative data or mathematical analysis (e.g. average, mode, range, maximum, minimum, total, etc.) for quantitative data. Display your analysis using graphs. Describe any trends seen in graphs. Discussion– Explain scientific principles supported or contradicted by your experiment. Explore any significance of your findings. Conclusion– While referencing your hypothesis (restate), explain what information has been definitively discovered. Do not speculate here. Your hypothesis can be supported or disproven. Follow your steps outlined in your approved research plan carefully for building the prototype. Take pictures at various stages of construction of prototype. Write down notes in your project data book (log book) re: issues that arise when building the prototype and observations made about possible improvements in method. Use the Scientific Method in testing your Prototype. Prepare empty data tables in your project data book (log book) to be used when recording data. Use a logbook to write down observations and project details recorded during the prototype testing. Keep a detailed record of your trials and data. Date any log book entries. Write down any notes about your experiments (include what worked and what did not work). If you created a scale (e.g. color scale 0-3, intensity scale, opinion scale), record in project data book what each number on the scale represents. This is a qualitative form of data, and your scale is a non-standard scale. Carefully record your measurements in data tables. Analyze your quantitative measurements using appropriate mathematical steps. Summarize your qualitative data using “mode” or “maximum” or “minimum”. Remember that qualitative results are not measured using a standard scale, and thus cannot be added, subtracted, multiplied, divided, averaged, etc. Draw graphs to show trends in the results of your prototype testing. Determine the success (or otherwise) of your prototype design. Take note of any trends seen in analyzed data. Record key observations in project data book (log book). Did the prototype succeed in achieving the original goals? What changes would be necessary for the design to succeed or improve? Were you able to make the suggested alterations? Do you have advice for future work with a similar model? Never alter your results to fit your theory. Try to explain why you obtained results that differed from the literature that you researched. Follow your steps outlined in your approved research plan carefully. Use a logbook to write down observations and project details recorded during the experiment or prototype testing. Keep a detailed record of your trials and data. Date any log book entries. Write down any notes about your experiments (include what worked and what did not work). If you created a scale (e.g. color scale 0-3, intensity scale, opinion scale), record in project data book what each number on the scale represents. This is a qualitative form of data, and your scale is a non-standard scale. Draw graphs to show trends in your findings to help answer your testable question. Take note of any experimental errors that may have impacted the accuracy of your data. Did the variable cause a measurable change when compared to the control group? What patterns do you see from your graphs comparing the variable with control? Did you collect enough data? Do you need to do more experimentation? Remember – one experiment can support a hypothesis but does not prove that hypothesis. A well designed experiment can disprove a hypothesis. Are there any practical applications for your findings? How can this information be used in the real world? How could you improve this project? Prepare a tangible display. 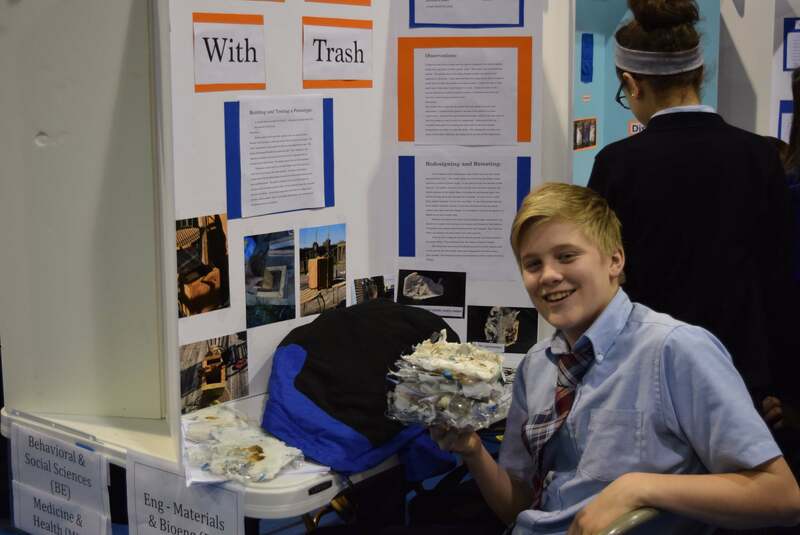 Bring only those items allowed by the Seton Science Fair. 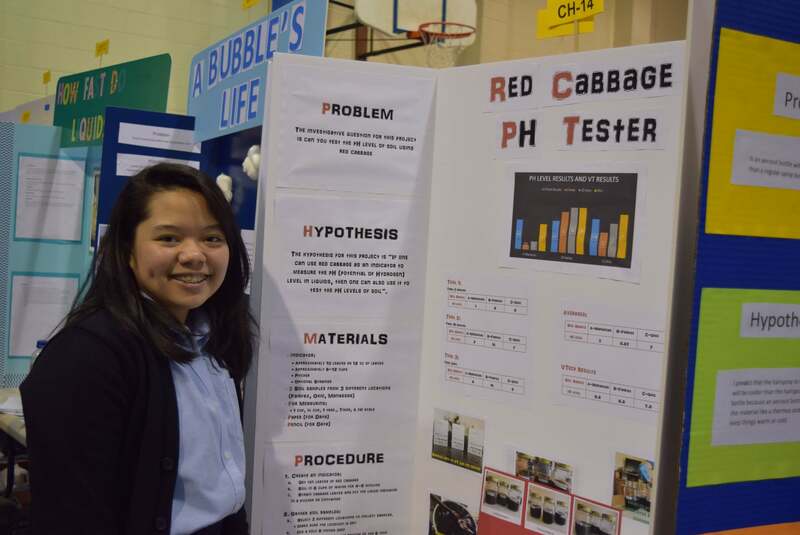 Project Presentation to judges on Monday, (Day of Science Fair) in gym (John Paul II Center). Students attend 8:30 AM Seton School Mass at All Saints Church before checking in at Seton. Where do I turn in my research plan and other paperwork to get pre-approval for my project? 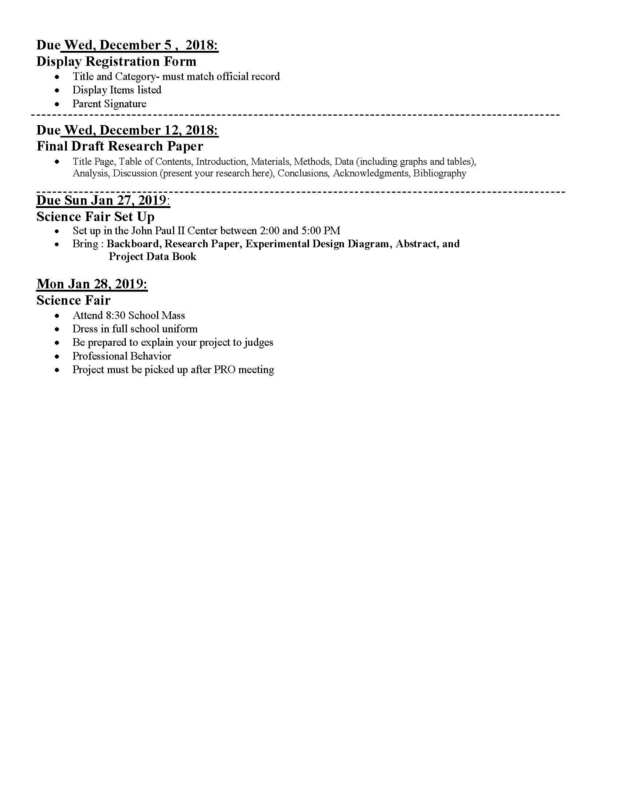 All science fair related paperwork is to be turned in to the science teacher supporting your project. For junior high school, paperwork is submitted to the 7th Grade science teacher. For high school, paperwork is submitted to the science department through your science teacher (Biology, Chemistry, Physics, Astronomy, Advanced Lab Science). Seton School has a Scientific Review Committee (SRC) and an established Institutional Review Board(s) (IRB). When can I begin experimenting? Students must submit a completed research plan and signed registration forms. These must be reviewed by Seton School Science Fair Committee and be approved BEFORE students can begin formal experimentation. Any data collected prior to approval cannot be included in project data. The start date of your project is when you begin to collect data for your experiment. This cannot be before project approval from Seton’s Science Department. Your science teacher will confirm this approval for each project. The literature review and the design of your study will occur prior to your start date. What is the difference between a Scientific Method Project and an Engineering Design Project? Scientific Method Projects utilize the traditional scientific method of experimentation with a single independent variable, constants, and a control set up. Data is gathered (“dependent variables”) and analysis of results is conducted. Scientific Method projects can be classified in ANY of the listed project categories (including ENGINEERING categories). Engineering Design Projects are a modification of the above. The need for construction of a particular structure / machine is defined, and Design Criteria are established. After constructing a prototype, the effectiveness of the model is tested (using the SCIENTIFIC METHOD of experimentation). Engineering Design projects can be classified in ANY of the listed project categories (including ENGINEERING categories). Seton School Science Lab is a BSL 1 Lab. 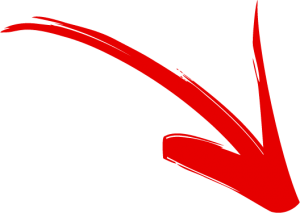 Any experimentation performed in other labs must be identified as BSL 1 or BSL 2. The criteria are available for ISEF affiliated fairs as self-assessment checklists for laboratories serving as sites for BSL 1 and BSL 2 studies. These checklists are available on the ISEF website. Can I order organisms from a biological supply house? No – any purchases of organisms or microbiology equipment will need to be handled by your science teacher. Payment can be made by check to Seton School through the main office. Coordinate this with your science teacher. Seton School IRB, after reviewing your research plan, will decide if you need to get documentation of informed consent (for adults), assent (for minors) and parental permission, or if only verbal consent is required. If written consent/assent/parental permission is required, it is documented on Form 4. If written consent is not required, the subjects must still give verbal assent/consent before participating in the study. a) If the participant is 18 years of age or older, the survey must contain a statement of informed consent that those taking the survey can read and check a consent given prior to continuing with the survey. This “check” can be considered documentation of informed consent. b) If the participant is under 18 years of age, the parent/legal guardian must give permission by signing and returning a informed consent form to you. An informed consent form is available with Form 4. Yes, farm animals may be used at a “non-regulated [research] site”, i.e., farm or ranch using only standard agricultural practices. 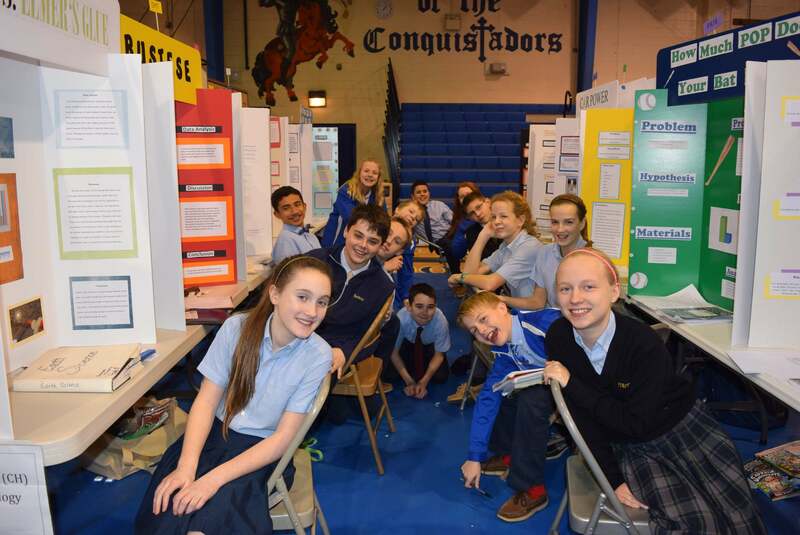 Are team projects permitted at Seton’s Science Fair? Team projects are not allowed at the junior high school level. High School team projects are allowed at the discretion of the science teacher.